This is Part #4 in The Flow Chemistry Collection, a regularly-updated round-up of the best content on flow chemistry, including blog posts and commentary from thought-leaders on a number of flow chemistry topics. Be sure to subscribe to be kept in the loop on future updates. Electrochemistry has a huge potential to offer synthetic organic chemists. The use of electrochemistry in modern laboratories, however, is generally quite low. This is largely due to the absence of suitable equipment that allows non-electrochemists a ‘convenient’ method to carry out this chemistry. For this technique to be more readily accepted as a routine procedure chemists need an easier, more user-friendly way to access it. Electrochemistry techniques in the past have relied on electrolysis in glass reactors that lead to poor reaction control, low selectivity, and reproducibility and slow reaction rates. These systems can be easily set-up but because of the reasons stated above, there has been a reluctance to adopt them. 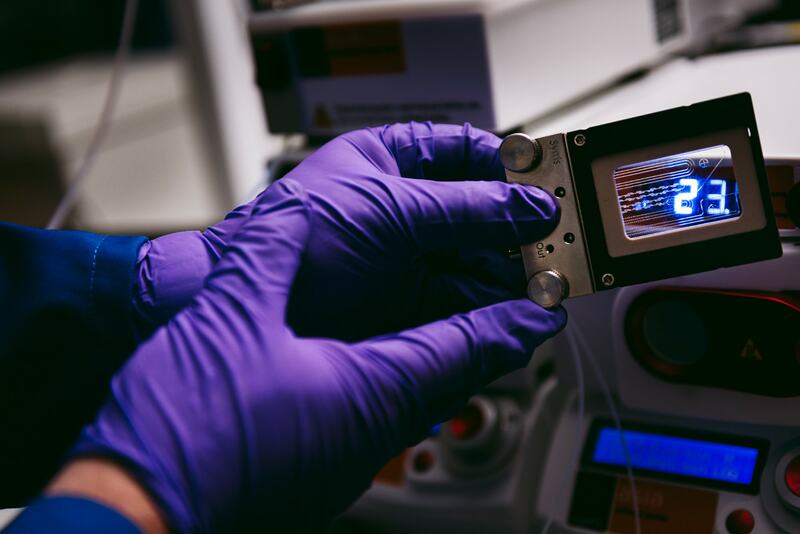 Over the past 5 years or so the development of continuous flow electrochemical cells has made selective syntheses with high reactant-to-product conversions possible, more often with a single pass through the device. These devices offer an easy access to electrochemical techniques which is driving its current re-assessment as a viable, attractive synthetic method. During an organic electrochemical reaction, organic molecules are activated by the addition or removal of electrons at the surface of an electrode through a heterogeneous process. An electrosynthetic reaction typically requires two electrodes (anode and cathode) in contact with a solution that contains an electrolyte. An electrolyte is a salt that provides ions to improve the conductivity of the solution. Electrochemistry can be performed in a variety of different methods either Potentiostatic mode (where the voltage across the electrodes is controlled) or Galvanostatic mode (where the current across the electrodes is controlled). If we consider that our reaction is performed with the addition or removal of electrons it’s easy to consider that our reactions will be REDOX – reductions or oxidations. These reactions often use hazardous and polluting reducing or oxidizing reagents such as OsO4, Pb(OAc)4, NaH etc. ; by eliminating the need of these we can consider electrochemistry to be a ‘greener’ method. Our chemistry is mediated by electrons, so we often perform our chemistry as room temperature reducing energy consumption. We can also consider our electrodes as heterogeneous catalysts allowing less waste in the work-up of our reactions. Furthermore, ionic liquids are often used replacing organic solvents which are readily recovered. The development of continuous flow electrochemical cells enables us to access this greener method and perform unique transformations enabling selectivity and transformations not possible by other techniques. Traditional methods of electrochemistry involve the use of ‘beaker cells’. Typically, in electrochemical literature, the precise description of this apparatus is not properly described. While electrode material is given, the geometries, positioning, and dimensions are not giving rise to difficulties in reproducing experimentation. 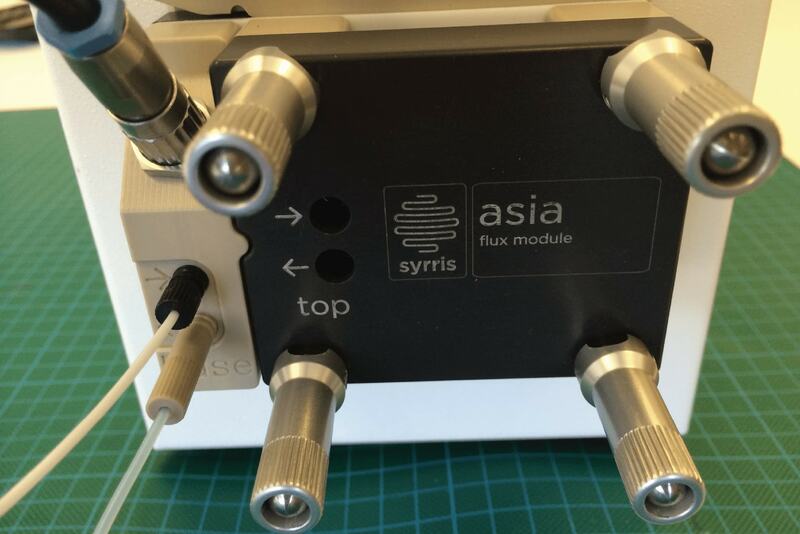 The development of continuous flow electrochemical equipment eliminates a lot of the problems with reproducing experimental procedures and confines variables to the electrode material and the synthetic procedure. Electrochemistry is a surface phenomenon meaning large surface area to volume ratios are required. This is something we know a lot about if we are familiar with flow chemistry in general. Flow reactors have a large surface area to volume ratio compared to equivalent volume batch reactors. It’s not a big leap to design a flow electrochemical reactor that creates a high surface area to volume ratio in respect to the electrode. One thing to consider with traditional methods of electrochemistry is that the electrodes are separated by a larger distance compared with there flow equivalent. A large distance between electrodes gives rise to loss of control of the charge passing between them resulting in ‘electron gradients’. The diagram below illustrates this with a simple oxidation. A range of electrons in our reaction can give rise to a loss in selectivity. In a flow electrochemical cell, the distance between the electrodes is drastically reduced. By reducing the distance between the electrodes, we can precisely control the electrons equivalents in our reaction and therefore increase selectivity. Most continuous flow electrochemistry cells are based on a parallel plate set-up, that is, a pair of electrode plates are divided by a small distance by a gasket that generates a flow pathway. The nature of the electrodes and the current or voltage applied across them controls the number of electrons equivalents passing between them into the reaction mixture. This electron flow can be considered as the reagent. The flow rate and concentration of the reaction mixture dictate the potential applied across the electrodes to generate the precise number of electron equivalents. This allows us greater control of our reagent and selectivity. By reducing the gap between the electrodes, we can often reduce or eliminate the need for electrolytes in our reaction, increasing their ‘green’ potential. Using these continuous electrochemical techniques can deliver reaction throughputs of up to multiple grams per hour. As electrochemistry is surface dependent, increasing the size of the electrodes can potentially increase this further. There is in an ever-growing number of literature examples using continuous electrochemistry that we could discuss here; a simple literature search will give you something to read. One example of electrosynthesis that is increasing in popularity in the pharmaceutical domain is the direct synthesis of drug metabolites which is the one I want to highlight. The understanding of how drugs are metabolized and their interaction in the body is of major importance in the pharmaceutical industry. Before any drug candidate is taken forward for further development a full understanding of its metabolites needs to be understood. In vivo, a drug molecule undergoes its first chemical transformation within the liver via CYP450-catalyzed oxidation. The chemical outcome of the first pass hepatic oxidation is key information to any drug development process. However, this often gives rise to a number of metabolites that require structural elucidation and resynthesis. If we consider the drug discovery process, a chemist is required to synthesize a targeted compound. Many synthesize require numerous reaction steps and purifications. If the chemist is lucky enough to obtain a lead compound a toxicity study is required to progress further in its development. This gives rise to several drug metabolites which themselves require investigation. The chemist then must go back in the lab and resynthesize these metabolites, more often via different methods. This is time-consuming and expensive. Researchers at the Sanford-Burnham Medical Research Institute In an effort to replicate these hepatic oxidations were the first to show that continuous electrochemistry can be used to simulate CYP450 oxidation and synthesize oxidative drug metabolite in a single step. 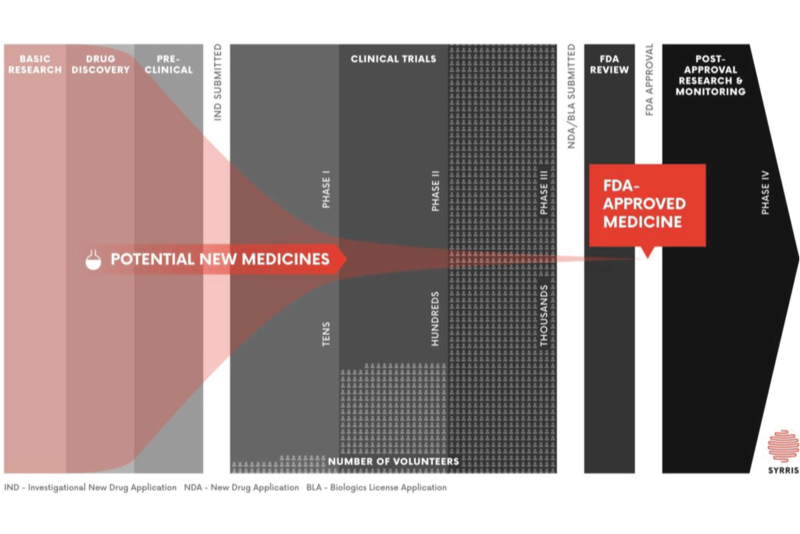 This has a huge impact on the whole drug discovery process. 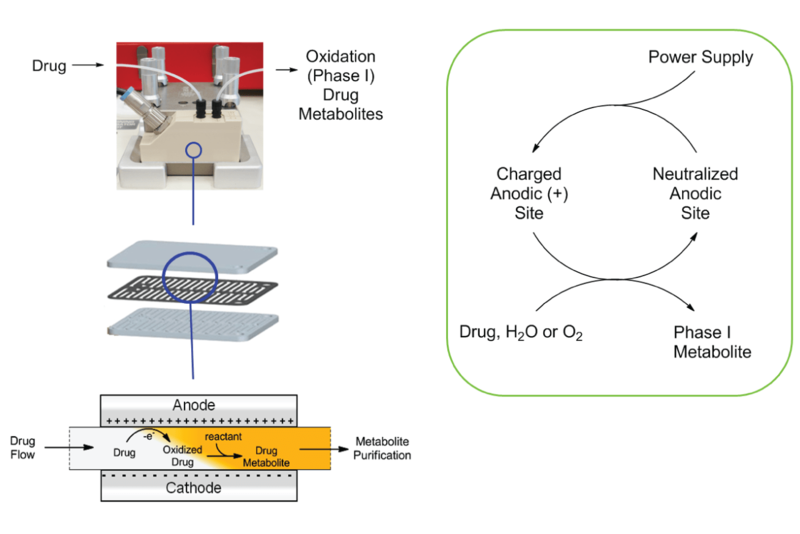 The figure below illustrates the use of a simple electrochemical flow cell and the oxidative pathway in generating oxidative drug metabolites. Several commercial drugs were subjected to continuous-flow electrolysis in the study. They were chosen for their various chemical reactivity: their metabolites in vivo are generated via aromatic hydroxylation, alkyl oxidation, glutathione conjugation, or sulfoxidation. The chemists went on to demonstrate that their metabolites could be synthesized by flow electrolysis with a throughput of 10 to 100 mg/hour, more than enough for further study. What is nice to show from this chemistry is the precise control of the electron equivalents into the reaction. The example below shows the selective oxidation of Diclofenac, one of the dugs in the study. By controlling the electron flux we demonstrate the optimization process in converting the starting material to its oxidized product. The development of continuous flow electrochemistry techniques is opening up the toolbox for synthetic organic chemists. With easy to use reaction set-ups the hurdle to access this synthetic technique is greatly reduced. 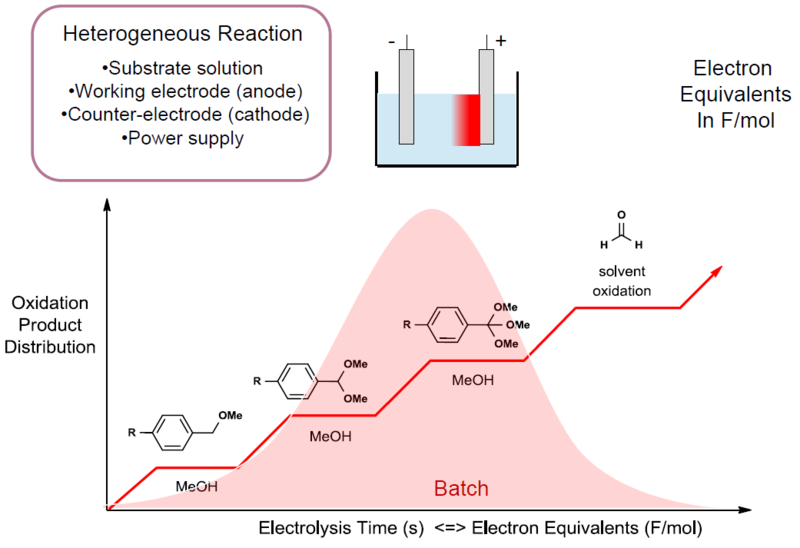 With the precise control of reaction parameters flow electrochemistry offers the potential for high selectivities and productivities over traditional techniques. 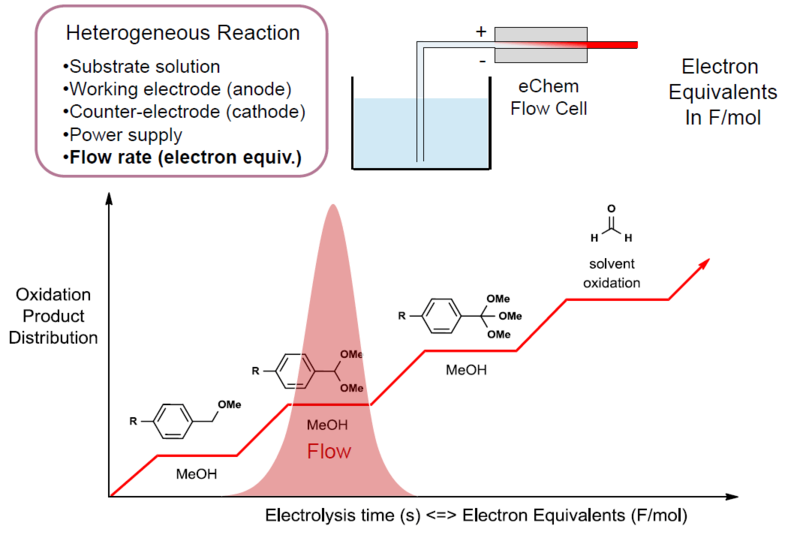 Coupled with the greener methodologies, continuous flow electrochemistry offers an exciting prospect for modern chemistry. 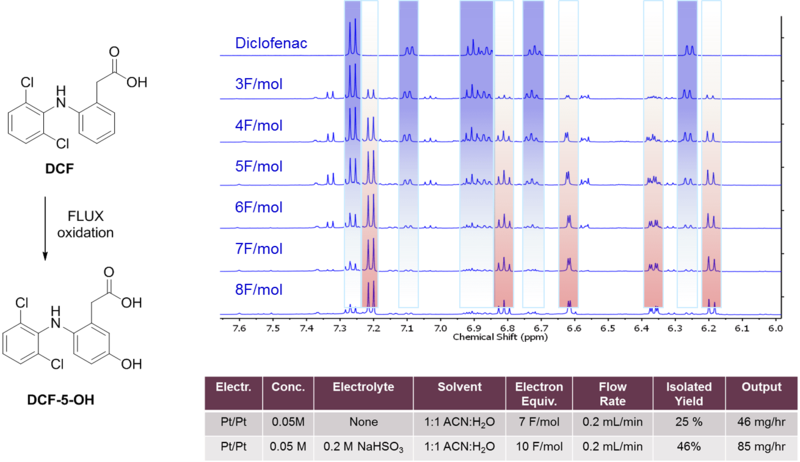 Curious as to how you could implement continuous flow electrochemistry in your lab? Then fill in the contact form and one of my colleagues or myself will get back to you. 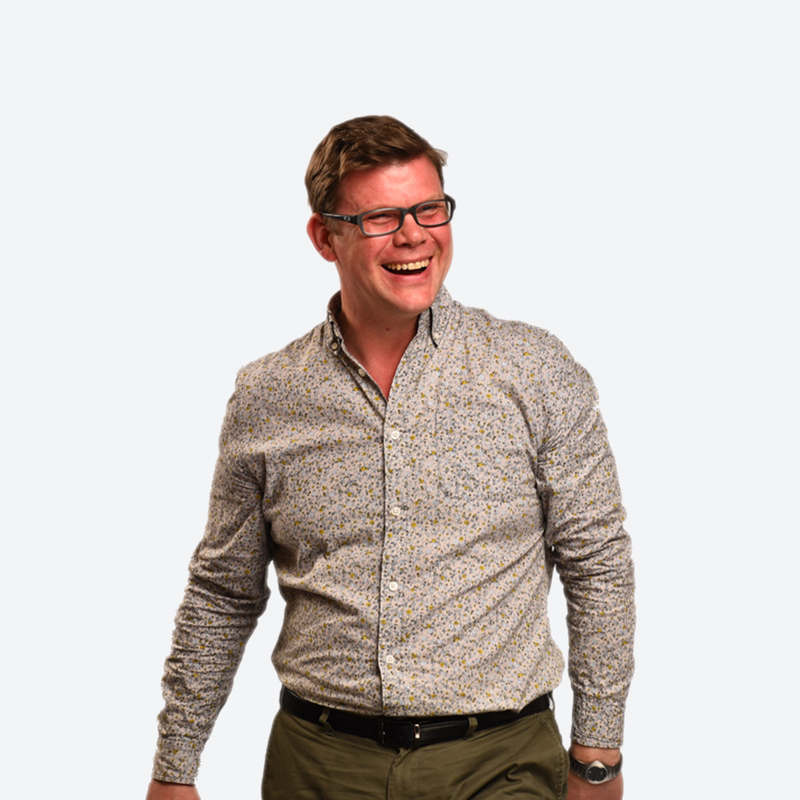 Andrew was formerly a Research Chemist at Pfizer and spent much of his career focusing on introducing flow chemistry technologies, meaning Andrew is well placed to lead Syrris’ flow chemistry offering. Read Andrew’s bio here. 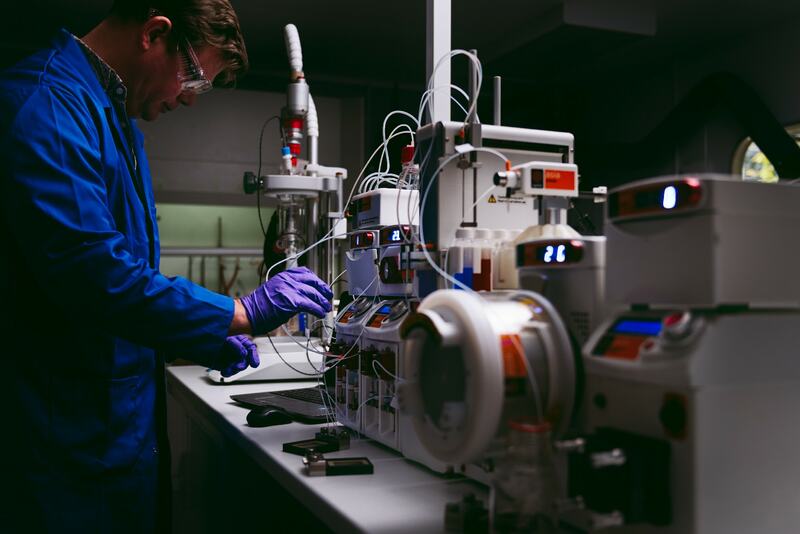 Continuous flow biocatalysis is fast becoming a key area of focus for chemists with applications in fine chemicals, drugs, biotherapeutics, and biofuels to name a few. 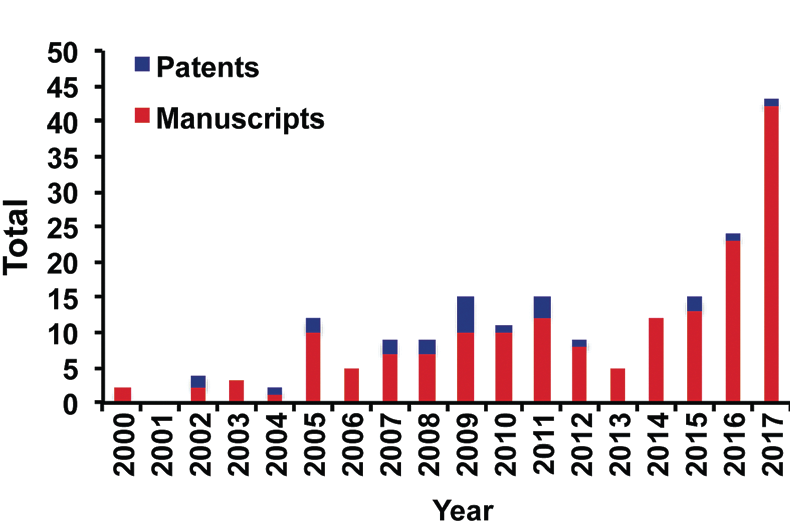 This is reflected in the rapidly-growing number of publications and patents featuring continuous flow biocatalysis; this blog post explores why.